The sample that I had them approve was made out of three strands of Pingouin Borneo Carmin 7301. When I went back to the Red Needle West, there was not enough to complete the project. Pingouin has been out of business for years. (This was on Wednesday 12:00). After work I went to Green Valley Weavers and tried every Rayon thread they had nothing worked. Rayon lasts better than Cotton and drapes better. Thursday at lunch I went to the last 3 places in Colorado Springs that might even sell yarn. No luck. So I called the Carmelite Monastery and told them I couldn't get the yarn. (Friday was the 4th and even if I went out of town, stores are closed. They needed it by Saturday.) I left work 5 minutes early and went back to Red Needle West. I was hoping that the received a shipment of new yarn that day or I had over looked a yarn. The desired color was red, but green would also work. (Different colors for ceremonies). At closing time I found a green yarn. Lane Borgosesia - 22 Guigno in Color # 23 (Very Dark Forest Green) It is 100% Rayon. Not as shiny as I wanted. It looks like it is a knit/cabled yarn. It did not come in dark red and did not look like a good candidate so I passed it over. I bought 8 balls and took it home. I had it finished by 10:00 p.m. on Friday. We are still going to pursue learning to make the authentic cincture but they were able to give their gift on Sunday. The Carmelite Nuns are going to write to the Franciscan Nuns to see if they have patterns. The Carmelite Nuns thought photographing their many cinctures was a good idea. I will keep you updated as this progressed. Thanks to everyone for their help. This is slightly modified from what Sharon sent me. It is the way the basic Romanian Cord is made. I used 2 strands for the braid. It needed to be at least 6 yards long. I got 6 yards and two inches when I ran out of the ball. So the braid took 2 balls. I used a size J hook for the braid. 1. 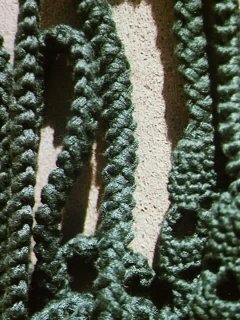 Make 2 chains and work a single crochet into the first of these chains. Now twist the work in a half turn to the left (clockwise). Work a single crochet into the second of the first two chains (the loop at the top of the work), inserting the hook from right to left through the loop when beginning the single crochet. 2. 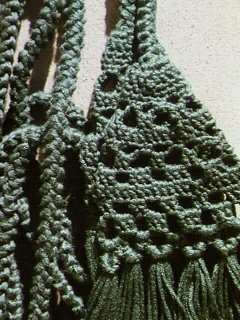 After completing the first single crochet, turn the work again in a clockwise direction. Put your hook into the two hoops that are on the left side of the braid. Yarn under and pull up a loop. Yarn over and pull through both loops. This is the way it is done in Romanian Needle Lace. It allows you to pull out the braid from either end to make it the same length. You could probably just to a regular SC but I didn't want to unlearn the rhythm of the Romanian Cord since I like to make it. 3. Continue to turn the braid each time after working the modified single crochet into the two side loops, until the piece at least 6 yards. (This is a very long braid. After a yard I put a safety pin in so I could measure how long it was. After two yards I pinned the second yard to the beginning. Then I pinned the two pins together. This gave me a folded half yard length. The braid gets very twisted and I needed a manageable length so I could let it hang to untwist every couple dozen stitches or so. Theses are the instructions for the Red Cincture Tassel. It is the one I used for the green cincture. The tassel and fringe took another ball of thread. 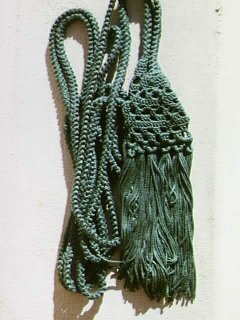 I used a size 1 hook and one strand of yarn for the tassel. Always Chain 3 for First DC of Round. Row 1) Chain 8. SL to join. Row 2) 14 SC in ring. SL to join. Row 4) Sc in each SC of row 3. Increase 3 times evenly around row. (17 sc). SL to join. Row 5) Sc in each SC of row 4. Increase 3 times evenly around row. (20 sc). SL to join. Row 6) * SC in next two SC of Row 4. Ch 4. Skip next SC of row 4. ** Repeat from * to ** around row. SL to join. SL to Ch 4 loop. Row 7) * 2 DC in Ch 4 loop, Ch 3 **. Repeat from * to ** around row. SL to join. SL to Ch 3 loop. Row 8) * 2 dc in ch 3 loop. DC in next two DC. ** Repeat from * to ** around row. SL to join. Row 9) SC in next two DC of row 8. CH 4. Skip 2 DC of row 8. SL to join. SL to CH 4 loop. Row 10) * 2 DC in Ch 4 loop. Ch 3 **. Repeat from * to **. SL to join. SL to Ch 3 loop. Row 11) 3 DC in Ch 3 loop. Ch 2. ** Repeat from * to ** around. SL to join. SL to Ch 2 loop. Row 12) * DC in next Two DC. 3 DC in Ch 2 loop. ** Repeat from * to **. SL to join. Row 13) * DC in next two DC. Ch 3. Skip 2 DC. ** Repeat form * to **. SL to join. SL to Ch 3 loop. Before working Row 14 Attach Tassel to Cord. Fold Tassel in half. The sets of 2 dc are the folding points. Row 14) 2 DC, Ch 3. * 3 DC, Ch 3 **. Repeat from * to ** three more times. 2 DC, Ch 3. * 3 DC, Ch 3 **. Repeat from * to ** three more times. SL to join. SL to next ch 3 space. Row 15) This Row is worked through the two layers of the tassel. Chain 6. Work 3 DC Chain 3. * 3 DC chain 3 through both layers of the next Ch 3 space. ** Repeat from * to ** three more times. Work 3 DC chain 3, DC through last CH 3 space. End off. Weave in Ends. 8 strands in each Ch 3 space. Measure the Desired Length. Pull the 8 strands through the ch 3 space to form a larks head knot.